I'm having an issue with one of my glazes cracking as it dries on the bisque. The problem is worse when it is put over another glaze. This of course leads to crawling on the fired ware. I've tried using Veegum T to toughen it up, but not to much effect. I have just inherited some CMC, but I don't know how to use it. Is that a possible solution to this problem? Or do I need to do something else? 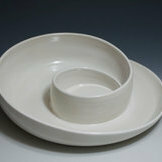 Maybe try adding some bentonite to the glaze; the glaze may not have enough clay in it so it is shrinking and cracking. Maybe thin the glaze a bit. Sounds like it is going on too think. I'll try the bentonite. From what I've read though, bentonite can cause the same problem. I was trying to avoid this effect. Would a 1-2% mix avoid exacerbating the problem? Marcia, It is pretty thin and I still have the problem. At the moment the glaze has a specific gravity of 1.47. I need a solution that will keep this sg. If I'm understanding the articles I've read about CMC, it can toughen the glaze. But, I don't know how to use it. From what I've read there is a learning curve to this material. I'm not a big gum user but have used it in salt kiln coatings for adhesion. Is there a large amount of kaolin in the glaze? If so then calcining 1/2 of it would reduce shrinkage / cracking. That usually happens to me with commercial glazes that get too dry in the jars. i have tried remixing with water, using the additive Amaco sells and nothing seems to revive them. Now i just throw them out if i see them cracking on the bisque.I hate to throw money into the trash can. Anyone have any luck with this? This is the recipe. There isn't a lot of EPK in it so I don't think that is the problem. I'm working on a newer version of this glaze so the problem could fix itself. I'll do a test on it this week. I have two commercial cone 6 glazes that have laid around and settled/dried up some. I've mixed them up, but they crack after being applied to bisque. They seem to have adequate water. Can anything be done to correct this? We have few glazes that are "clay based" and they do not like frit based glazes when applied to bisque ware... or was it the other way around.